After ten years at the forefront of LGBTQ+ culture, The Marlborough Theatre needs your help to keep going. Aaaaaand we're done. 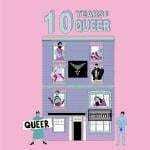 Thanks to everyone that donated to/shared our 10 Years of Queer Crowdfunder, we have successfully raised £11,208 with 323 supporters in 56 days. We are totally knackered but so, so grateful. Watch this space for Marly theatre improvements! We love you!!! Thank you SO MUCH to everyone that has donated and shared so far. Have a listen to this video of Marly team members Tarik & Ema chatting about how we plan to make the marly more accessible if we reach our stretch target! THANK YOU SO MUCH FOR YOUR SUPPORT!! We never thought in a million years we'd make the target with a week to go. OMG we are so close!! A personal thanks by email and a mention on our website to let everyone know you supported us! A personal thanks by email, a mention on our website and a specially made thank you video from one of our fave artists. A limited edition, specially made tea towel featuring self portraits of 100 artists we have worked with! As well as personal thanks by email, a mention on our website and thank you video from one of our fave artists. This will provide a new chair in the theatre. You will receive a limited edition, specially made tea towel featuring self portraits of 100 artists we have worked with, as well as personal thanks by email, a mention on our website and thank you video from one of our fave artists. A one hour photography session with the Marly's own favourite photographer Rosie Powell. This will keep us in loo roll for the year! You will receive a limited edition, specially made tea towel featuring self portraits of 100 artists we have worked with, as well as personal thanks by email, a mention on our website and thank you video from one of our fave artists. This will buy a new light for the theatre. You will also receive a limited edition, specially made tea towel featuring self portraits of 100 artists we have worked with, as well as personal thanks by email, a mention on our website and thank you video from one of our fave artists. A meditation session with mentor, meditation teacher, women in tech advocate and Marly Board Member Rifa Thorpe-Tracey! You will also receive a limited edition, specially made tea towel featuring self portraits of 100 artists we have worked with, as well as personal thanks by email, a mention on our website and thank you video from one of our fave artists. A Sleepover with Harry Clayton Wright! The performance artist, Marly resident and instagram darling will hold a slumber party like no other for you and your friends including dinner, cocktails more rom coms than you can shake a stick at. You will also receive a limited edition, specially made tea towel featuring self portraits of 100 artists we have worked with, as well as personal thanks by email, a mention on our website and a thank you video. An exclusive dining experience with performer, educator, Marly board member and Come Dine with Me winner Brian Lobel! Brian will cook a three course dinner for you and 3 friends. You will also receive a limited edition, specially made tea towel featuring self portraits of 100 artists we have worked with, as well as personal thanks by email, a mention on our website and thank you video from one of our fave artists.